The Professional Series MFC-5890cn all-in-one is perfect for your presentations, signs, spreadsheets, reports, photos and more with versatile printing from 4" x 6" up to 11" x 17". 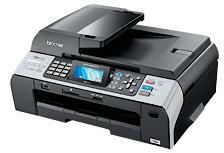 Save time with unattended fax, copy and scan up to 8.5" x 14, using the large 50-sheet auto document feeder. It also has high volume paper handling with up to 150-sheet paper capacity. High Impact Printing. Up to ledger (11" x 17") paper printing- great for presentations, spreadsheets, signs, photos and more! Built-in Wired Ethernet Network Interface. Allows you to share the MFC now or in the future. Just plug it into your wired (Ethernet) or wireless (802,11b/g) network router and share it to print, scan, PC Fax and access to the digital camera media cards or USB flash memory. Large Paper Capacity. Standard paper tray can hold up to 150-sheets of paper from 3.5" to 11" x 17". Secure Function Lock. Allows you to restrict public access to certain machine Secure Function Lock functions such as Fax, Copy, Scan and Print.